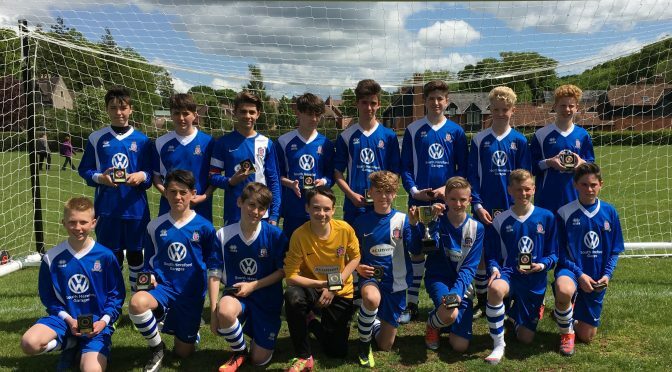 On Sunday 14th May the Lads Club Terriers U14 team won the inaugural R S Signs & Engraving Cup. In a hard fought physical game Lads Club came out on top 4-2 against Tenbury Wells. All the team performed brilliantly , with special mention going to outstanding centre forward Hubert Dejnowiec, who scored all four goals ! Managers Mike Shaw and Steve Nicholas, said ‘ It has been a solid season , especially since Christmas, and this Cup win is the icing on the cake. All the boys have worked very hard and keep improving. All are friends, all go to Whitecross School, and we look forward eagerly to next season.